There are numerous factors which influence the cost of any car lease deal, the most obvious being the selected vehicle’s market value, the lease duration, the agreed mileage limit, and the degree of maintenance included. Leasing costs can inflate significantly however, once insurance, tax, fuel, and any applicable penalty fees (for damage and/or excessive mileage) are added, and so it’s hardly surprising potential lessees are always looking for the most affordable quotes! The vast majority of online car lease comparison calculators only take the fixed monthly fees charged by different dealerships into account though, and they are not always overt regarding what is, or isn’t, included in any particular deal. To get a clearer understanding of the true value of, and any additional costs involved in any lease contract, it is best to conduct some research. Those who decide to a lease car do not have to worry about the resale value of their selected vehicle (assuming they’re not interested in buying it at the end of the leasing period). However, knowing how much certain models of car might depreciate is helpful for determining the value of a lease agreement. This is because the monthly lease charges quoted by a dealership are dependant on the chosen vehicle’s expected rate of depreciation: the difference between the vehicle's price as new, and its predicted worth at the end of the lease. Understanding how much a car might depreciate can help to ensure you are in a good position to negotiate the rates of your lease. You may wish to attempt to haggle, for example, if you feel you are being charged too much for a car that will still hold a significant percentage of its original value at the end of the contract. The impartial, consumer-focused car buyer’s guide What Car? provides a very simple online depreciation calculator, the results of which are presented in a useful graph form, making it possible to compare many models quickly and with ease. Simply click the down arrow on each field box to input the make, model and version of the car you are interested in leasing and then click the orange ‘Calculate’ button. Take a look at the results! 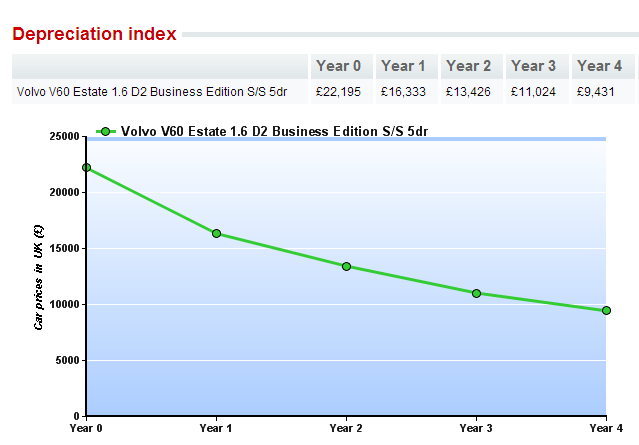 Simply hit the back button in your browser window to calculate the depreciation of an alternative vehicle. If your employer buys or leases a company car on your behalf and allows you to use it for personal journeys, you will be liable to pay company car tax. You will also be required to pay tax on any fuel paid for by your employer which is used during your personal use of the car. Personal use of a company car and its fuel is considered a ‘benefit in kind’ (also known as a ‘fringe benefit’ or ‘employee perk’). Such benefits have monetary value, and so those in receipt of them are expected to pay appropriate tax. To calculate the due tax, first the value of the benefit in kind needs to be determined. 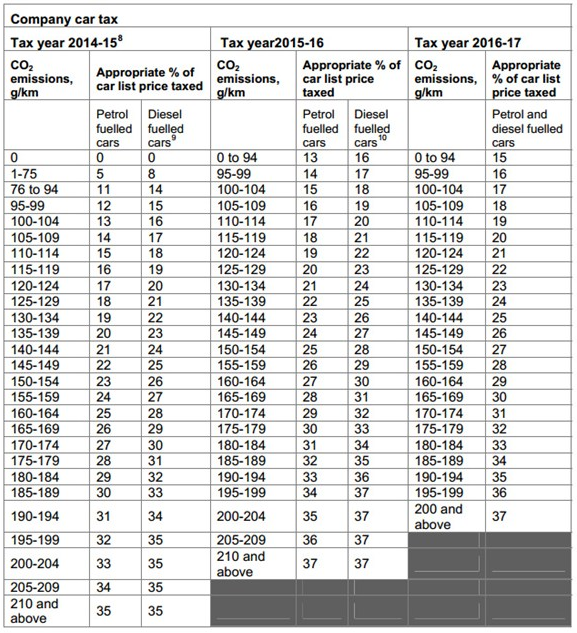 A percentage of the vehicle's taxable value (and fuel costs, if relevant) is considered. 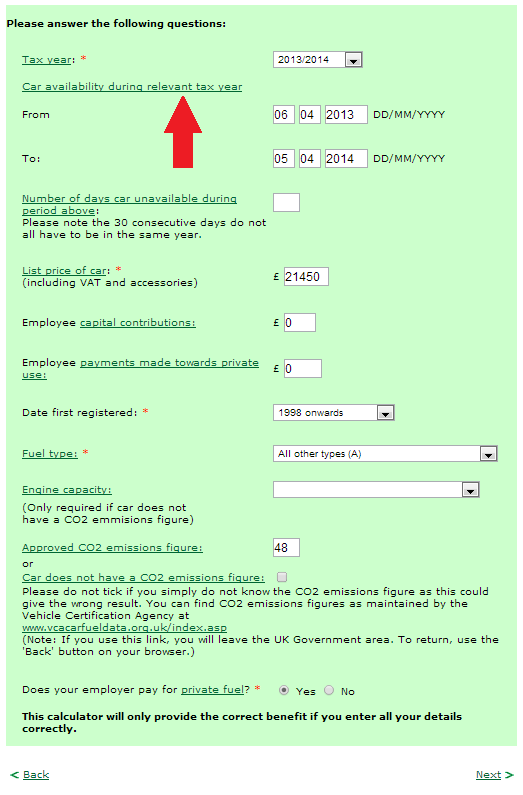 This percentage is determined based on the motor’s CO2 emissions figure (see image below)*. Drivers will be expected to pay 20%, 40% or 50% of the value of the benefit in kind as tax, depending on annual income. Conveniently, HM Revenue and Customs provides an online calculator so you can see estimates for the company car and fuel tax you will have to pay this year, or the amount that was due in a previous year. Unfortunately, you cannot use the calculator to determine future charges, though selecting ‘2013/14’ can give you an idea of how much tax might apply in 2014/15. Complete all fields on the first page before clicking ‘Next’. If you are unsure regarding the meaning, or applicability, of any of the fields, simply click a green link (marked with a red arrow in the image below) to see a helpful advice page open in a new tab. 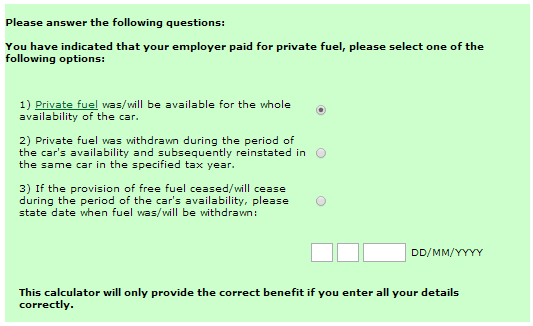 Assuming you have entered valid information, and selected ‘Yes’ for the final question, you will then see the following form (those who select ‘No’ will be sent straight to the calculation results page - see step three). Select the option relevant to your circumstances and click ‘Next’. That’s it! 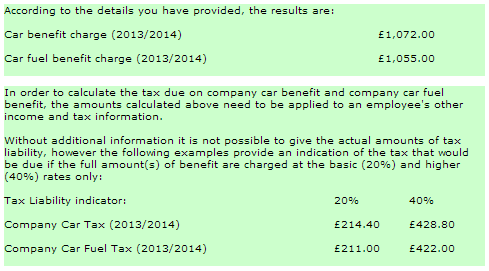 You’ll then see the final calculation results page, on which car benefit tax estimates will be provided. As the calculator states, it’s hard to provide completely accurate results until the employee responsible has completed their tax return. Car insurance is seldom included as part of car contract hire agreements, since too many variables - including the leases age, selected model, driving experience, and previous accidents and/or claims - are involved to offer set rates. As such, it is the lessee's responsibility to seek insurance from a provider. It is obviously important to check that a lease agreement is still affordable once insurance payments are added, before signing on any dotted line - researching your vehicle and its associated insurance options is highly recommended. If you’re looking to compare premiums from a number of different insurance providers, it is advisable to use an online comparison calculator from an independent and impartial site, such as USwitch: approved by the Financial Conduct Authority (FCA). This calculator is particularly good, for it offers estimates even if you don’t currently own, or lease, the car you’re seeking a quote for. NOTE: You will likely also have to pay for GAP (‘Guaranteed Auto Protection’) insurance to protect your leased vehicle. Should the a vehicle be written off during its lease period, the relevant insurance company will only payout the value of the vehicle at the time of its demise (i.e. depreciation is taken into account). GAP insurance can help to bridge the gap between the vehicle’s retail price, and the payout offered by the insurer, and this helps to protect lease dealerships from loss. Unfortunately, there are no independant GAP insurance calculators online, for the cost of such is very much dependant on the individual circumstances of, and other protection invested in by, the lessee. You will then be greeted with a series of data entry forms - most required fields are self-explanatory, but should you find yourself stuck at any point, simply hover your cursor over a field to see a helpful blue text box appear (see image below). Once you have completed a form, click the green ‘Continue’ button to reach the next. The entire process shouldn’t take longer than five minutes. When data entry is complete, you will be greeted with a list of car insurance quotes, ordered by price (low-high). 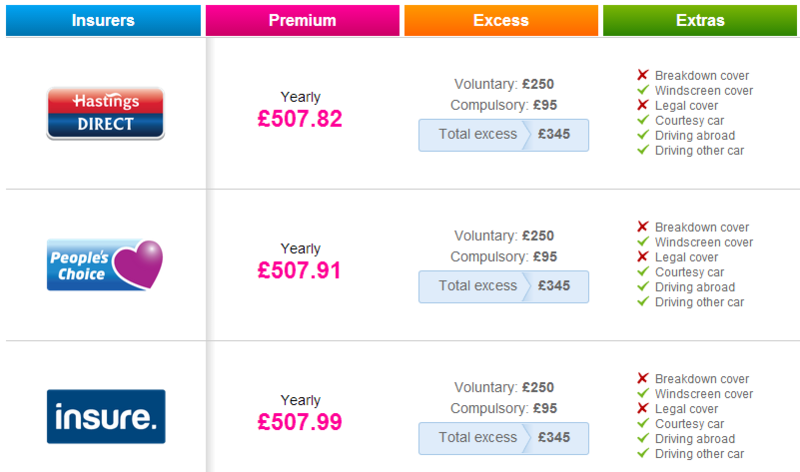 Simply make further enquiries about any premium that appears ideal for the car you’d like to lease. Need further help choosing your lease deal? Contact leaseyournextcar.com today for friendly, no pressure advice.